The ability to move beyond fragmented efforts depends in large part upon integrating quality internal and external information in order to identify fraud early. As carriers adopt more innovative and effective fraud-detection solutions in response to the growing threat of fraud, they need equally innovative and powerful investigation management systems to manage the increased volume of complex referrals being generated. They also require the ability to accurately identify and segment fraudulent activity from legitimate activity in order to improve the productivity of both investigative and detection staff while simultaneously increasing customer service and satisfaction. 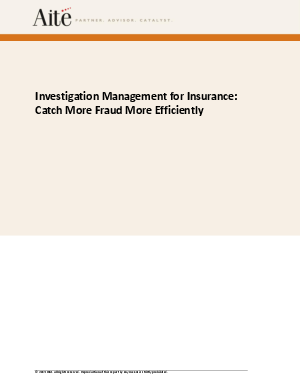 This white paper covers the ways in which organisations are embracing enterprise investigation management technology, describes the characteristics of best-in-class platforms, and concludes with an overview of IBM's approach to enable business to be more effective and efficient with their fraud investigations.